North Carolina State University researchers are using light-activated molecules to turn gene expression on and off. Their method enables greater precision when studying gene function, and could lead to targeted therapies for diseases like cancer. NC State chemist Dr. Alex Deiters decided to use Triplex-forming oligonucleotides (TFOs), which are molecules that can prevent gene transcription by binding to double-stranded DNA. To more precisely control TFOs, he attached a light-activated “cage” to a TFO. 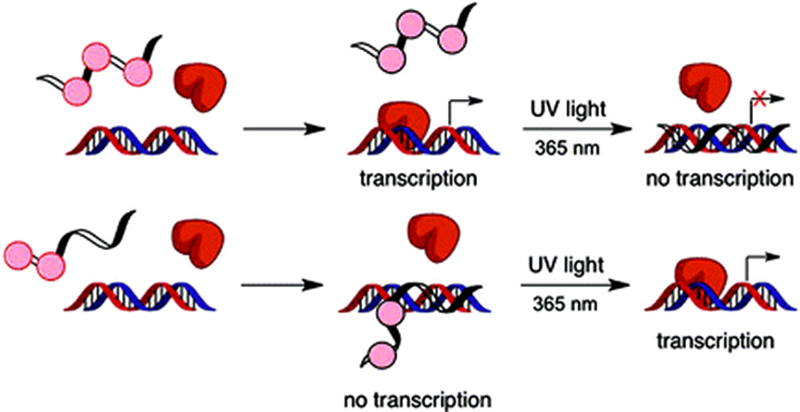 After exposing TFO to ultraviolet (UV) light and removing the cage, the TFO is free to bind with DNA, inhibiting transcription of the gene of interest. Additionally, Deiters fine-tuned the process by attaching a caged inhibitor strand to the TFO. In the absence of UV light, the TFO behaves normally, binding to DNA and preventing gene expression. However, when exposed to UV light, the caged inhibitor activates and stops the TFO from binding with DNA, turning gene transcription on.